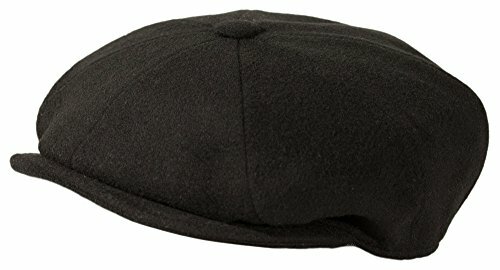 Levine Hat Cashmere 'Classico' 8-Panel newsboy Cap (XXLarge (Fits 7 3/4 To 7 7/8), Black) by Levine Hat at Sherlock Coat. MPN: 1126QJCRK8H. Hurry! Limited time offer. Offer valid only while supplies last. CASHMERE NEWSBOY CAP - Cashmere/Wool blend cap with luxury feel: cashmere is soft, rich, smooth and warm. CLASSIC 8 PANEL SHAPE NEWSBOY CAP - Medium body newsie cap with button on top looks great on all men and complements various face shapes. QUILTED SATIN LINING - A quality cashmere cap deserves a quality finish. The Classico is complete with a quilted air-puffed satin lining which adds extra warmth and comfort. FOUR CLASSIC COLORS AVAILABLE - Comes in Black, Brown, Charcoal or Camel: an option to match every outfit. Complete the set and you complete your ourfit! Camel, Brown and Grey are designed to match most men's coat colors in wool and cashmere! MADE IN ITALY - Handcrafted of the finest Italian materials and finished with excellent quality and craftsmanship. Double stitching; lining colors that complement the cap's color; excellent fit and high level of consistency and attention to detail is why the Italians make the finest caps in the world. If you have any questions about this product by Levine Hat, contact us by completing and submitting the form below. If you are looking for a specif part number, please include it with your message.